The London Transport Museum Covent garden has to be situated in one of the best entertainment locations in London, which makes it perfect for a great day out. This page highlights the exhibits which can be seen on the museums First floor Gallery. There are two main gallery subjects on this floor as well as a connecting bridge which takes you over to a learning and discovery area for the children. 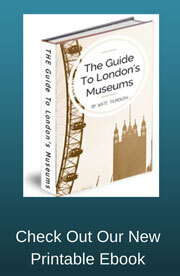 On the right side of the gallery is the story of steam trains and the first underground system in London. As the population grew and the streets became more congested it became necessary to find another way to carry passengers around London. Work began in 1860 on the first underground system of tunnels, the first was known as the Metropolitan line which open in 1863. In 1868 a second was opened known as the District line, then in 1884 a third known as the Circle line was added which joined all the lines together. There are many items in this section of the gallery which illustrate what it was like to travel on the trains during this time. There are even two full size steam engine and carriages to give you a real sense of what the trains were like. It is possible to sit in a couple of the carriages for yourself, I loved this as you get the full experience, the smells and feel of the seats etc. The video above shows the interior of the train. Personal stories can be heard around the gallery at sound posts, these stories come from real accounts of life working on the railways. As the population grew and as transport networks expended so did the creation of new out of London suburbs. With the ability to buy new cheaper housing out of town but with easy cheap train connections to get you back into London to work, many people decided to leave inner London for these new towns. Metro-and was one such suburb which was in fact created by the Metropolitan railway itself. During this period poster were designed to promote these new out of town Suburbs and the exciting leisure and lifestyle benefits they held. 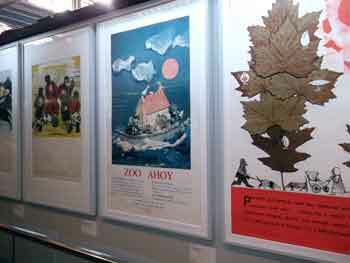 Some of these posters can be seen in this gallery as well as the John Burniham Poster Parade. As you walk out from this gallery a mock up of a period sitting room has been built which allows you to sit and enjoy a film promoting train travel at the time. On the same floor there is a glass bridge which takes you across the centre of the London transport Museum Covent Garden and which gives you great views looking down at the various collections. Across the bridge there are two learning areas. Learning Lounge - This is where you can sit down and find out more about the collections held in the London transport Museum Covent garden and the subject or transport in general. Interchange - This area id for children aged between 7 to 11. 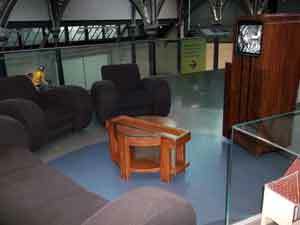 It is a hands on area where they can explore for themselves, uniforms, mystery objects and even drive a Optare bus.